So I am pretty sure that Nika does not sweat. Now that the weather is getting really hot, I have noticed her turning really red. And this is not red as in sun burnt red, it is red as in overheating red. As soon as I bring her inside, she returns to her normal color. I have heard that some kids with Down syndrome do not sweat, or do not sweat as much as they should. I know Payton sweats, although I'm not sure she sweats as much as the typical kid does. Alas ... it hasn't been an issue with her. With Nika, however, we have a problem. I mean look at the picture of her ... that is not normal. This picture was taken after she played outside for maybe 30 minutes. So you guessed it ... I need words of experience from those that are familiar with this. Guess we will be having some testing done. I have always turned beet red when playing outside in the heat, or exercising (indoors or out). Since I was an itty bitty. I have noticed Ainsley is the same way, she doesn't even have to do much and her face turns bright red. Her and I both, so beet red. It doesn't take much either. Isaac gets red too, but not as bad as us two girls. I should send you a picture of me and Ainsley. . . us two tomato heads! From what I understand it's just blood rushing to your face. One way your body cools down is to increase blood flow. So when I work out or am embarrassed I blush so bad, which makes it even more embarrassing LOL! but Elias is turning red, and we dont have an answer to why, but i notice that with sun gets aweful! And I was in the best shape I've ever been when this picture was taken, so it wasn't the run that did me in! LOL! Rylee gets red like that, too!! (However, she does sweat a little...) She gets hot easily and quickly, though! I am curious to know if it's something with Nika you need to be concerned about -- keep us posted!! My Noah gets really red when in the heat. I just make sure he has lots of water and he is fine. I have no advice, but I just want to kiss that little face!! Eian didn't sweat his 1st summer he'd get all red and break out. it was awful. we were really worried. His dr was just about to send him to a specialist when we noticed around spring that he was now sweating. Talk to your dr.
Angela has Anhidrosis, and it is relatively common in kids with DS. I don't remember if you have a developmental pediatrician, or an endochrinologist, or a dermatologist. Any of those can order a sweat test (the same test done to check for Cystic Fibrosis) It's a definative test. Angela does not sweat AT ALL. 70* is hot for her, and really most of the summer she spends indoors in the AC unless she's going to be in the water. She has suffered heat stroke a couple of times, and it's very scary. She can go from "fine" to "limp as a dishrag" in a matter of seconds. Once her internal temperature starts climbing it doesn't stop unless you do something to cool her off. Mayson sweats but she still gets red. especially her arms! i wonder if it does have something to do with blood flow like brooke said! hmnnn...very interesting. Geez, I am always learning new things about DS! Thanks for this post...and oh my...she is just sooo adorable!! She is absolutely one of the cutest little girls I have ever seen! Grace hardly EVER sweats. Jack sweats enough for all of us (even if he isn't playing, he sweats). I don't sweat very much (even working out)....maybe that's my problem :). Praying Addison is ok and the testing goes well. Oh, my! Poor baby. She looks HOT. My daughter does not have Ds, but she is exactly the same! She does sweat, however, she also turns beat read, like a tomato, after being in the heat (even in the shade) for more than 10min. I think some kids are just different on how they process the heat. I don't think it is anything to worry about. 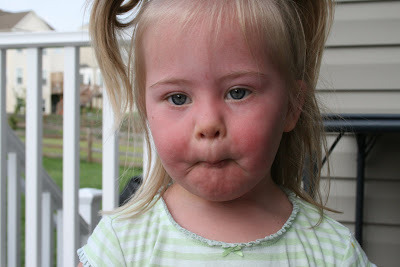 Just keep the sunscreen acommin and she'll be ok.
Man she gets cuter and cuter with each photo. WOW the toe head is coming out! What a cutie! Meg had the sweat test done by her Pulminologist if you have one of those. Meg does not really sweat but the doc didn't seem concerned. She doesn't really turn red though either...hmmm...I turn red but thought it had to do with my coloring....I hope you can figure it out! Maybe it's a Russian thing, my Russian gets the same way. LOL! !